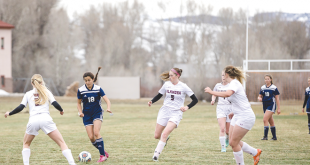 The season kept chugging along for the Crested Butte Titans girls soccer team. They secured a big home win over Telluride to improve to 10-1 and were set to face Center on Friday, April 27 and then head to Del Norte on Tuesday, May 1. Center would be a coast for the Titans. Earlier in the season they cruised to a 5-0 win. The second time around, coach Julia Kidd was looking for even more out of her team. “I wanted to see better finishing and playing possession soccer while maintaining their speed of play,” says Kidd. The Titans did what Kidd asked as they rattled off six goals in the first half and tacked on four more in the second for the 10-0 win. Livie Nute led all scorers with a hat trick, Rachel Potoker tacked on two more and Siena Truex, Tess Fenerty, Ella Lapello, Murphy Sloan and Sydney Stoneberg added one goal apiece. The Titans then headed to Del Norte to face the Tigers on Tuesday, May 1 and revenge was on the mind of both team and coach. The Tigers have spent the better part of the last several years handing the Titans brutal losses in volleyball and basketball and the Titans wanted to make things right on the soccer field. The Titans opened the game setting the tone for possession and pace and their effort was rewarded early as Mya Schaffer broke free up field to score in the eighth minute of the game. Six minutes later the Titans struck again when Hazie McNellis laid the ball out wide to Karina Davalos and Davalos dribbled to net to slip the ball past the Del Norte keeper for a 2-0 lead. The Tigers recovered from the initial onslaught using their speed up top to threaten the Titans. They finally broke through later in the half to break the seal on the Titans net to pull within one heading into halftime. “Their two girls up top were so fast and they were really good at moving the ball,” says Kidd. The Tigers had a chance to tie it up early in the second half when they were awarded a penalty kick. But Potoker read the shooter and made the save, keeping the Titans’ one-goal lead intact. The two teams then proceeded to trade off attacks with Del Norte relying on their speedsters up top to create chances. The Titans did knock not one, but two, shots off the crossbar during the melee but Del Norte eventually tied the game with 12 minutes left in regulation eventually sending it into overtime. 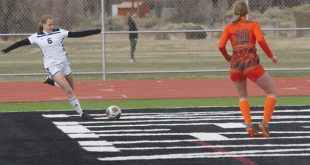 Before the two teams could even get back into the battle, the Tigers converted on a corner kick early in the first overtime to hand the Titans a painful 3-2 overtime loss. The Titans are now 11-2 and hovering around one of the key top four spots in the state seedings with two games left to play. Fortunately, their last two games are at home as the Titans host Pagosa Springs on Friday, May 4 here in Crested Butte at Rainbow field at 3:30 p.m. They close out the regular season on Saturday, May 5 when they face Bayfield in Gunnison at 1 p.m.